The Keeshond temperament makes her a joy to be around. She loves people – any people, all people, doesn’t matter…people! She loves spending time playing with her people during the day, then curling up with them on the couch at night. Perhaps more than many breeds, temperament is so very important to understand. When she is properly trained and socialized, she can be one of the most friendly and well-behaved dogs out there. The Keeshond temperament can truly make her a joy of a dog to own. This is partly because she is one of the few dogs who does not have hunting, herding, or any kind of attacking in her history. Breeders bred the Keeshond for companionship, and that is what you get with this dog. 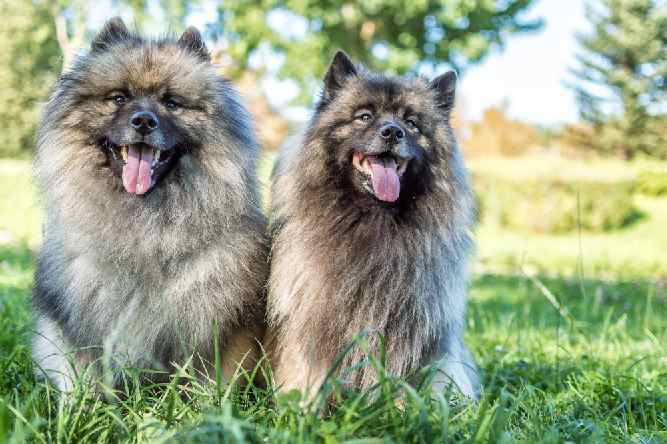 Here are a few traits you need to know about the Keeshond temperament that can help you decide whether she is the right dog for you. The Keeshond has a strong jumping ability and lightning-fast reflexes, which make her both agile and nimble on her feet. The Keeshond has a sturdy body that does her well when she’s out playing and having a good time. The Keeshond needs companionship just as much as she needs her daily exercise. In fact, she prefers if those things happen together. She is very playful because she knows it gets her the attention she so desperately craves. She’s even playful with strangers. In fact, Keeshond Dogs have a nickname: “The Smiling Dutchman” because of the way they curl their lips and “bare their teeth”. The gesture is not mean whatsoever, though – she’s actually smiling! Like many other intelligent dogs, the Keeshond can use her intelligence for naughty things. That’s right – they can be rather mischievous when they want to be. Your Keeshond may also use her smarts to manipulate you into getting her own way. So be on the lookout for that. Keeshonds, especially Finnish Keeshonds, have shown exceptional skills with regard to being obedient. This makes training them a much easier task. One thing to note about the Keeshond is that they do not respond well to loud noises. This is one of the reasons why she makes for a terrible guard dog. Keeshond doesn’t really have a protective streak, as she tends to be more welcoming than suspicious of strangers. When they bark it is usually to say hi. The Keeshond is great with children, which makes her a wonderful family dog. They love the indoors as much as the outdoors, so they are up for joining you in anything you want to do. Finally, the Keeshond is quick in several ways: she’s quick to learn, quick to love, and quick when it comes to playtime. While you may have seen the breed referred to as the “Keeshonden,” this is incorrect. The breed’s name “Keeshond” comes from “Kees” and “Hond.” “Kees” is the nickname of 18th-century Dutch Patriot, Cornelis (Kees) de Gyselaer, and “Hond” is the Dutch word for dog. The importance of de Gyselaer is that he was the leader of a political rebellion. The Keeshond became the symbol of the rebellion, and so too was the dog named after its leader. Keeshonds are very smart, which makes them highly trainable. This is always a relief to prospective Keeshond owners. In fact, the Keeshond is one of the most obedient breeds out there. Therapists often use Keeshonds as therapy dogs because of how well they learn and listen. However, trainers must keep sessions short and interesting to keep the Keeshond’s attention. You must use positive reinforcement, rather than harsh scolding, as she is rather sensitive. Food rewards work wonders – just take care not to let her gain weight as a result. The best time to start training a Keeshond is between 10 and 14 weeks old. Because she’s so smart, she’ll end up learning things eventually, but they may be the wrong things. That’s why you need to be there to help her sort it out. You can probably tell from looking at her coat that the Keeshond requires a lot of grooming. As for Keeshond shedding, a brushing once a week should be enough. You need to do some light trimming around their feet regularly to keep their pads neat. If you’re wondering “is the Keeshond hypoallergenic?” the answer to that question is no. No dog’s coat is hypoallergenic. The best way to tell if you’re allergic to a Keeshond is to spend time with the breed before bringing one permanently into your home. You must bathe and blow out your Keeshond’s coat every four to six weeks. If you don’t feel comfortable doing it, or if you can’t find the time, take her to a professional groomer. Keeshond puppies are some of the most adaptable dogs out there. Got a smaller living space? She’ll cope. Have a large farm to run around in? Just as good. The Keeshond is happiest when spending time with her family. So whether you let her out in the yard or take her for a walk around the block, exercise with her and she’ll be overjoyed. 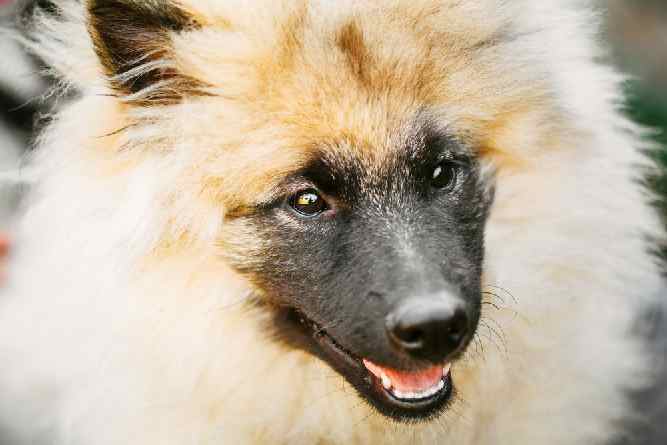 There are many health conditions that can affect the Keeshond. The average Keeshond size is between 17 and 18 inches tall. Despite all of the above, the Keeshond's life expectancy is between 13 and 15 years. Note: Don't let the many issues above scare you. The best way to approach health problems is to prevent them in the first place. The Ultimate Guide to Dog Health is a great place to start. Get a copy to keep at home. It will help you prevent the painful health issues that can plague your lovely Keeshond pet from expressing his winning personality and maximizing his life expectancy. 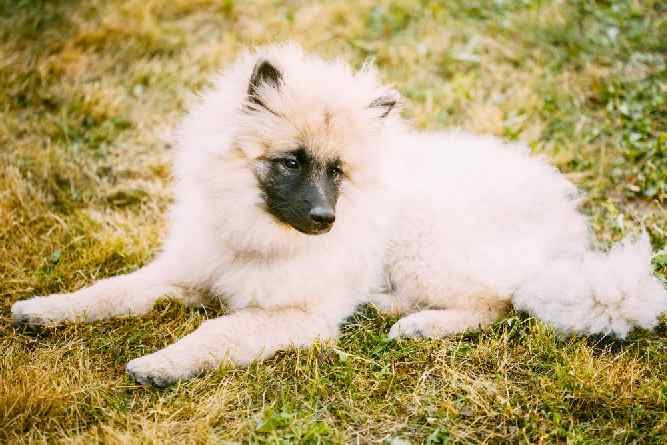 Are you considering adding a Keeshond puppy to your home? How lovely! You can find listings for a Keeshond for sale from either a breeder or a rescue or adoption shelter. The average Keeshond price can vary wildly and can go as high as $4,000. The price of a Keeshond for sale depends on its lineage and whether the dog is of show quality or not. On average, though, a Keeshond for sale typically costs about $600. If you want to adopt a Keeshond puppy, check with your local Keeshond rescue organizations or adoption shelters. 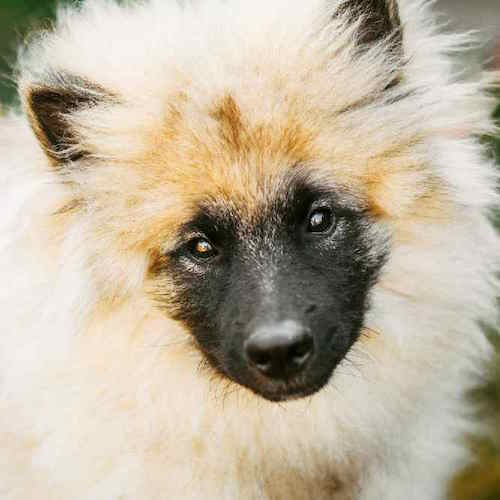 In looking for a Keeshond for adoption, you may be more likely to find a Keeshond mix. This is because people are more likely to give up mixes for adoption than purebreds. So, if mixed breeds are your thing, then adoption is definitely the way to go. A good resource when looking up Keeshond breeders is The Keeshond Club of America. There are numerous breeders posted from all over the country, along with their contact information. Reach out to a couple of the breeders in your local area before making your decision. Make sure they can provide health clearances and the proper certifications for the dog of your choosing. Conclusion: Why the Keeshond Dog? The Keeshond temperament makes her one of the sweetest, friendliest dogs you could ever own. She approaches everyone with a warm welcome. She is not suspicious of strangers and, in fact, thinks everyone is here on earth to be her friend. Keeshonds are sturdy dogs who can hold their own but are also vulnerable to several health concerns. Be aware of the conditions that can develop so that you can seek treatment as soon as signs present themselves. Next post: Puli Temperament (Energetic, Agile, & Loyal): BUT… Newbies Beware!! Previous post: Sealyham Terrier Temperament (Fearless, Even-Tempered): Can You Handle This Stubborn Fella?